If you have a house hold of big and little kids in your family then you about to fall in love with this toy. It is all about STEM and involves lots of construction. Its the Geomag Mechanics Gravity Catch and Shoot System. Geomag are very much a STEM (Science, technology, Engineering and Maths) focused company. 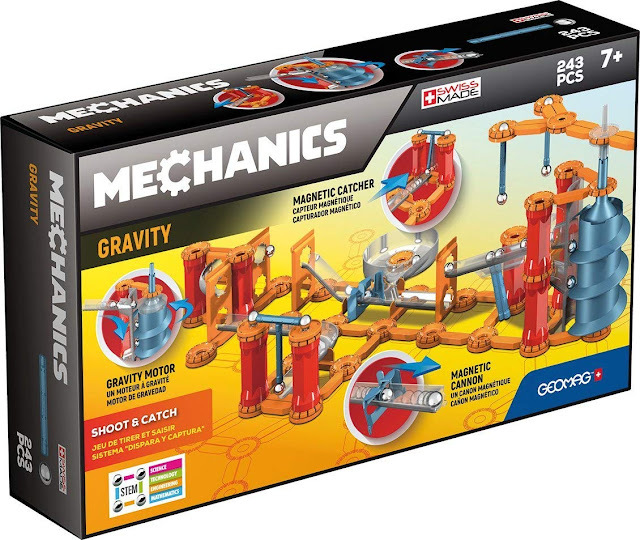 Which is why they have brought out a new range of toys which is all about combining gravity with construction. Geomagworld’s R&D department has managed to develop an innovative “gravity motor” This uses the weight of the Geomag spheres to kickstart the mechanisms of the Geomag Mechanics structures without using electric motors or batteries. The movement is achieved in a green and sustainable way. The use of fundamental laws of physics, such as magnetism and gravity, makes Mechanics Gravity a particularly STEM product. It is able to stimulate and deepen your scientific knowledge from older age primary students to secondary levels. The system is made up of magnetic rods, steel spheres and elements of different shapes such as cylinders, bearings and modular parts. When assembled correctly, you can use the force of gravity to create chain reactions for never-ending fun. The shoot and catch version of Geomag Mechanics (as pictures above) contains 11 magnetic rods and 36 steel spheres. You can then construct this together with 196 plastic mechanical elements. When built watch the balls fly around the construction at magnificent speed and see the magnets in use to help move the balls around the structure. This toy is recommended for children aged 7+ and is at a retail price of £70. 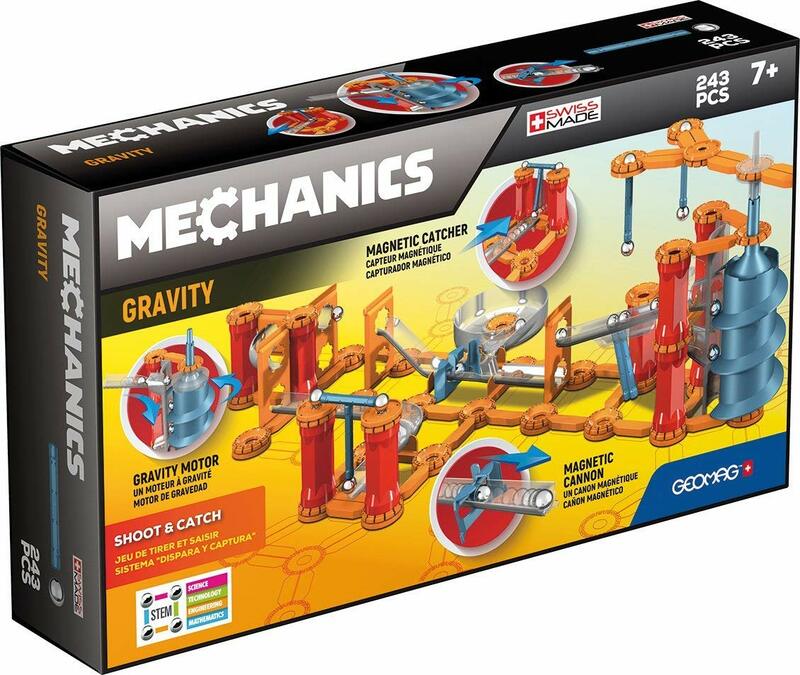 Get your very own Mechanics Gravity by clicking here! Who would like to win one? Its the perfect gift for christmas. I think both children would enjoy this but think it would help my Son improve his fine motor skills most. My youngest daughter would love it - and I also think her three older siblings will want to have a goo too! in all honesty, my hubby would be hooked! This looks so much fun - my nephew would love it! My son would love to play with this toy. My grandson Alexander aged 7. My 8 year old brother, I'm sure my 3 year old bro would love to watch it too! My 7 year old son would love to play with this. My nephew would absolutely love this, I'd definitely win some top aunty points! The boys would love this toy. Hopefully they would collaborate and share :- Which could be really interesting and productive. My son and daughter would both love this....... and me too! My son would love this - he is really into building and constructing anything so would be perfect for him! My 9 year old granddaughter - she wants to be an engineer designing theme park rides when she grows up so this would be perfect for her, giving her a great grounding in mechanics and dynamics. And fun at the same time! My son! He loves Geomag! Looks like a really fun toy - my nephew would love it! Both my children will love it. We love Geomag. WOW, perfect for my mini scientist in the making! My daughter she loves building! I think we would all want to play with this! My nephews would absolutely love this! Our eldest would like it and I think daddy would want to help. My youngest would absolutely love this! My grandsons would love making something wonderful with this toy! My Nephew and his Dad would love this! My 9 year old daughter would love this. She loves to work new things out, so it would be great. My two nieces would love to play with this set. I think both my girls would have fun playing with it together. My daughters would love to play with this prize, would be a great Christmas present! My middle 2 children would love this. My daughter is STEM obsessed and she would love this. my youngest daughter - she would LOVE this! I would like to win this for my nephew who would love it. Thanks for the competition. My granddaughter would absolutely love this and would play with it all day! My 8 year old son would love this! I could see my son spending hours building with this, its right up his street! My boys would both love this! I'd like to say my son, but in all honesty I might enjoy it when he is in bed! What a fab giveaway! My nephew is always taking things apart and I'm sure he would love to play this with his cousin, keeps his fingers busy!